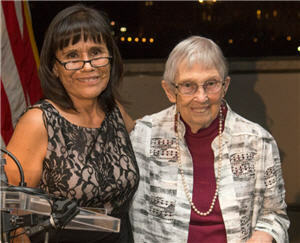 FNLM Board Member Lucretia McClure (right) presents the Michael E. DeBakey Library Services Outreach Award to Patricia Bradley, MLS. (Photo by Michael Spencer). “When you live in a rural region here, it’s hard not to see the poverty all around you,” says Patricia Bradley, who is the Native and Distance Services Librarian for the University of New Mexico (UNM) Health Sciences Library and Informatics Center (HSLIC). They have been her focus since she joined the UNM 10 years ago, where she researches, writes, and teaches, and develops and leads special projects designed to identify and serve the health information needs of diverse populations. For instance, as a member of the UNM School of Medicine’s Combined BA/MD Admissions Committee, she helps recruit prospective medical students from underserved communities who will return to New Mexico to practice medicine. She also serves on the Tribal Connection Four Corners (TC4C) Group that links tribal communities to reliable, high-quality health information on the Internet in a collaborative project developed by the health sciences libraries of Arizona, Colorado, Utah, and New Mexico (the “Four Corners” states), the National Library of Medicine, and the National Network of Libraries of Medicine. “How to use the Internet is very important for people and I thank my partners for helping in this critical outreach effort,” Bradley remarked in accepting her 2014 DeBakey Award. 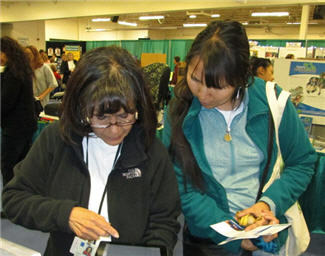 Bradley demonstrates resources at a community health services conference. Although technology has facilitated greater access to online classes and quality health information, challenges remain. Internet connections and services are often uneven in rural areas, and many residents lack computers, tablets, or mobile phones. So Bradley travels the region contacting small rural libraries. Last year she brought computers to four such libraries, and followed up with training on how to access reliable health information from NLM’s MedlinePlus.gov. For a 2013 survey of New Mexico practitioners not affiliated with UNM, she visited nine rural sites throughout the state, interviewing 51 physicians, physician assistants, nurses, nurse practitioners, and pharmacists about their information needs. She later co-presented her findings at the Medical Library Association South Central Chapter 2013 Annual Meeting. The presentation subsequently helped lay plans to promote MedlinePlus, PubMed Health and other NLM online information services. Bradley developed HSLIC’s guide to the Affordable Care Act (ACA) and travels widely in New Mexico to advise Indian Health Services nurses and managers about the services available through HSLIC’s Native Health Database, and NLM’s PubMed and MedlinePlus. Bradley belongs to the American Indian Library Association and numerous other Native American groups, and is a Distinguished Member of the Medical Library Association Academy of Health Information Professionals. She is widely published, producing posters and presentations on native health and health care issues, including the evaluation of rural health care resources. Prior to UNM, she served as a Tribal Liaison Librarian and Special Populations Outreach Coordinator. She began her career as a circuit librarian for the Navajo Health Authority in northeastern Arizona and she credits her first mentor, Elizabeth Hendryson, with showing her the impact outreach librarians can make in a rural community. November 3, 2014 in People.